Conference Presentation in Washington, D.C.
Abstract: This paper applies the concept of mutual dependence to Chinese-North Korean relations via an analysis of the Chinese Civil War and the Korean War. Specifically, the paper introduces new evidence on North Korean aid to the Chinese Communist Party during the Chinese Civil War and argues that this aid created a real credit upon which the DPRK could draw, not simply during the Korean War, but down to the present day. While North Korea may be increasingly dependent on China today, to the North Korean leaders themselves there is no particular historical reason for North Korea to kowtow to China. Observing and documenting this binary reality helps to rebalance our understanding of the China-Korea dynamic during the early Cold War, and, while not rejecting the idea of Korean dependence after 1950, gives the North Koreans credit for having allowed the Chinese to accrue revolutionary debts in what was often a skillful fashion. 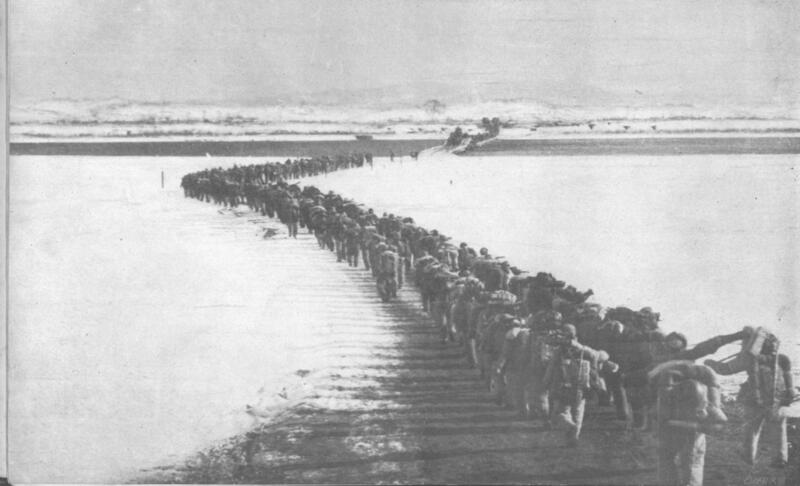 Chinese troops cross a frozen Yalu River into North Korea in autumn 1950.